Womens Care Consultants – Dr. Timothy Philpott, M.D. Born and raised in St. Louis, Dr. Philpott first received a BA from Carleton College in Northfield, MN in 1987. He received his MD from Washington University School of Medicine in 1994 where he was awarded the Samuel Soule Award for Excellence in OB/GYN. He completed OB/GYN residency at Barnes Hospital/Washington University in 1998. He was awarded First Place in the Resident Research Project and received the Excellence in Laparoscopy Award. He has been Board Certified in OB/GYN since 2001. Dr. Philpott was a founding member of Women’s Care Consultants in 1998. He is currently a Fellow in the American Congress of Obstetrics and Gynecology and a member of the volunteer clinical faculty in the Department of OB/GYN at Washington University. He has been listed in the Best Doctors edition of St. Louis magazine annually since 2005. 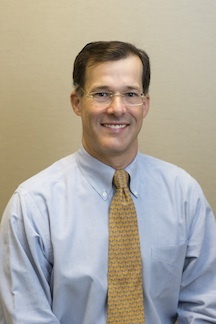 Dr. Philpott specializes in the area of minimally invasive/laparoscopic gynecologic surgery, including da Vinci robotic hysterectomy, myomectomy and treatment of pelvic organ prolapse. He performs outpatient hysteroscopic procedures, Endometrial Ablation and removal of fibroids and polyps. Dr. Philpott commits much of his time to caring for his pregnant patients. He is a general obstetrician with special interests in vaginal birth after c-section (VBAC), reducing the incidence of episiotomy and proper timing of labor induction. He personally delivers 95% of his own patients.